i am guest blogging this week and next at stir crazy, blogs.tampabay.com/food. i'll still post top chef tomorrow night, and i swear, i'm almost done with part 3 of super mario weekend. i just don't want to forget anything before i post it. gotta go clean so i can start cooking tonight. okay, so the first thing that stands out about the quickfire: radhika is so concerned that she is going to be pigeonholed as the indian chick that she makes an indian dish for the second consecutive quickfire. but those jerks are probably going to think that's all she can do anyway. apparently, this week, it worked. "i finally proved that i CAN make good food." um, it was a hot dog. even if it was good, it was one quickfire. until she tasted fabbio's, i got the impression that donatella didn't like any of them. she hadn't reacted at all when she tasted radhika's. whatever. at least the loser of the quickfire didn't get sent home this week. although, as it turns out, that would've saved us some time. when they announced the elimination challenge, i thought it was weird that everyone seemed to jump up and down that they wanted to do dessert. have they not see the show? then, the best part, they all later seemed to be acting like they never wanted to make dessert. like they were somehow relegated to it. i have been to that whole foods. it's pretty crazy. its on two floors, which makes getting around with a cart. and i never saw ostrich eggs. i'm definitely going to look next time. and they had an amazing selection of seafood. it's hard for me to believe that they didn't have fresh crab. it's too bad that apparently, jill didn't see what happened when patrick got excited about an ingredient he had never used last week. sure an ostrich egg is cool. but if you don't know how to open one, seems like a really bad idea. of all the nasty things that people have said about dishes on this show over the years, "dog food" and "glue" are about as bad as it gets. as far as the winners, certainly interested in the spherical olives. all over it. the chowder sounded good, carla probably didn't need the cheese. but wasn't the difference. fabbio wins. makes sense. and hey, carla's crust is flaky. who'd've guessed? i don't know that i see the purpose in bringing in the people who weren't good enough to get on the show to talk smack about the people that did. i mean, makes for some catty comments, but their opinion seems less than useless. hosea seems good enough that being in the bottom three is an aberration. ariane seems to be a fixture. jill seemed to have no idea where she was, much less why. when padma said that the choice was clear, have to say that i was pretty sure it was ariane. i mean, she spit it out. but i guess at that point i had forgotten about the gluey dog food. i think ariane needs counseling. life just seems to be too much for her. she seems nice enough, but i don't know how you can cook with that little confidence. postscript: hosea and leah appear to have no chance of getting into team rainbow. okay, i want to start doing this, but its so hard to keep everyone straight -- no pun intended -- the first few weeks. i sort of think they should have an introductions episode where they profile everyone before they start eliminating people. that would create an extra episode of one of bravo's most successful franchises. how have they not thought of this yet? i mean, we're definitely going to have to sit through reunion shows. this would be at least as interesting. anyway, not only do they eliminate someone on the premiere again this year, but they eliminate TWO people. in the quickfire, when i saw two people making salads, i fairly well suspected that the two people not making salads were safe. lauren's salad looked perfectly good, but perfectly ordinary. i was not remotely surprised to see her sent packing. but by about the second time they interviewed patrick, i was already tired of him and his culinary school. and everytime he talked about wanting to show people his "passion," i thought, yeah, because you have no perspective to show them. i realize i'm one of the few people with enough stamina to watch next food network star, but he immediately reminded me of kelsey from last season, whose entire breadth of life experience seemed to have come from culinary school. she seemed perfectly lovely, but she wasn't going to tell me anything she hadn't just learned in class. so imagine my delight when patrick picks an ingredient that he has never worked with for the elimination challenge. seriously? it seemed like christmas. i knew when he picked the black rice noodles he was screwed, and then when he seemed so surprised that he didn't know how to cook them, i giggled. i'm sure he's a nice guy, but i didn't miss him and he wasn't even technically gone yet. i would go through the contestants one by one, but we didn't learn enough about any of them to make reasonable judgments, i'd say. i know that four of the five seasons that the eventual winner has been a finalist the first week, and i know everything i have read seems to suggest that everyone thinks stefan will be there at the end, but i'm not sold. even if he is the best cook, i have a different statistic: only one time in top chef history has the person whom i thought was clearly the best cook won the season, and that was season 1 (harold). in season 2, sam was certainly the best, probably followed by cliff. ilan won. ilan was not in the top 5 that season, i thought. in season 4, i didn't have a clear favorite between stephanie and richard. stephanie won. so that one was close, i guess. of course, i have not tasted anything that they are judged on, and i am handcuffed by editing. but that is how it looked to me those seasons. i was very happy to see leah make the top 3 after having a hard time in the quickfire. 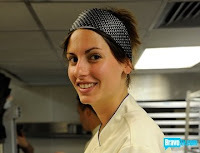 she is the only one that works at a restaurant i am familiar with, working for anne burrell in nyc. so i can root for that. and jeff is a florida guy, so i can get behind that, too. if i were to predict, i would say jeff makes it somewhere in the middle, week 7-8-9, and leah probably makes it a little further. but that's who i'll be rooting for. i've already had enough of carla. she appears to be insane. of course, that was all it took for andrew to make it to the latter stages of season 4, so i'm guessing she hangs around awhile. and, someone, please explain to me why the sexual orientation of the person cooking your food is relevant? or better, don't explain it. i don't want someone's orientation to even be CLOSE to a factor in the preparation of my food. why why why do we have to hear about that every season? i don't care. at all. it reminds me of the simpsons episode where there is a gay pride parade, and they are shouting "we're here! we're queer! get used to it!" and lisa says, "we watch your parade every year. we ARE used to it." here's what i'm thinking: whenever i turn on bravo, i do it with the understanding that there is a better than average chance that someone on the screen at any given time is probably gay. team rainbow. please. whatever. they're already selling t-shirts on the bravo website. sigh. also, i can't root for anyone who landscapes their facial hair. sorry danny. see ya. anyway, hopefully this recap will make more sense in future weeks as we begin to learn who we are dealing with. i know that half of the people who read this watch top chef. please discuss. so darcie, left, drops us off at the elevator to our suite and tells us to come back to the tailgate site after the race for dinner. we go up to the suite and sit down. it was then that i realize that i had totally forgotten about reo speedwagon. oh well. they're in clearwater in april. i got over this very quickly. just as the race is about to start, i send out a text to a bunch of people -- i don't remember who all, and it is extremely possible that i picked recipients randomly, plus i have never sent out a mass text before, so don't be mad if you did get it. i don't remember what it said, but it was something innocuous, like, "i think mario liked me." that set forth an avalanche of texting that took like two hours and caused me to need to delete my inbox and my outbox because they both got full. to put that minor fact in perspective, i have had this phone for about nine months and only cleaned out the inbox once (like, a week earlier), and don't think i had ever cleaned out the outbox. pam started texting people too, and we were just sitting there laughing and reading texts to each other. i suspect that the nascar fans sharing the suite with us found all the just fascinating. but we later had to hear that one of the women in the suite had won her tickets in a wet t-shirt contest, so she killed us on tmi points and made me not care anymore. and, i mean, umm, not sure if i can say this, but that would not have been the most interesting wet t-shirt contest ever. just sayin. it was while we were in the suite that ellen texts pam and tell her about the ap photo, to which i will gratuitously link. again. CLICK HERE. it was a little harder for us to get into sunday's race than it had been saturday's, mainly because it was much longer, and as good a sports as we were trying to be on developing an interest in nascar, there is a certain statute of limitations on left turns. but i was glad carl edwards won, because it was fun to watch the backflip and all. plus we had seen him at asphalt chef the night before. so after the race, we made our way back to the tailgate site, and it was darcie, leo (our limo driver, left) and billy harris, who was the emcee at the asphalt chef. wine was open, bread and cheese were on the table. so we sat there and watched gridlock and talked about the day. eventually, i asked about dinner, suspecting that we were just going to break out leftovers from the tailgate party. which, if there were arancini, i was set. no leftovers, darcie says. "you're cooking." ok, cool. what am i cooking? here's what that meant: there were four rental luxury RVs on the site. each had a fridge. except for darcie, the occupants of the RVs were all gone. so any food in the RVs was probably going to get tossed when the rental company picked them up. in two of the RVs, all we found was wine and beer. not telling whose RVs those were. in the other two, here's what we found: a bag of romaine. pepitas. a bag of arugula. two lemons. a green bottle of something that had a label that was all in italian (i assumed nice olive oil, but was wrong), a half-full gallon jug of olive oil, a bag of spinach ... and three steaks that had not been cooked at the tailgate party. now, to call these "steaks," kind of does a disservice to them, in lumping them in with earthly cow parts. these things were insane. they were from allen brothers. they were 3-inches thick, and 48 oz each. that's three pounds. each. there were five of us. the number floating around the tailgate party that afternoon was that the steaks were worth $100 each. i just looked on the allen brothers website, and it appears they retail for $130 each. i asked darcie if she REALLY wanted me to cook all three steaks, since there were only five of us. the consensus was that it was now or never for these steaks. then we talked to the people who were tailgating behind us, and they were interested in one, so we wrapped it up and gave it to them. there were five. they were all upscale vikings. i decided to camp out at the biggest one on the lot. u know, not for any particular reason. well, ok, because it was the biggest. first of all, there is no flame. its all infrared burners. there are two burners and a broiler. the burners get to normal grill temperatures, but the broiler element can burn your eyelashes off from 15 feet. plus, it had two side burners. so i get everything preheating, and unwrap the two steaks i have left to cook, and pam keeps asking me, "do you know how to cook a three-inch steak?" "yes," i said. meaning, theoretically, i knew that heat should be involved. but i had never even seen a three-inch steak before that afternoon. so there was a practical issue involved. i knew one thing: i needed salt. pepper would be good, too, but i needed salt. and i didn't see it anywhere. "i don't know if we have salt," darcie says. these steaks are amazing. i can't cook them without salt. we need salt. it's a moral imperative. "okay, i'll look again." she goes through two of the RVs. nothing. "you sure we need salt?" i told her not only do we need salt, but she has to tell mario that i refused to cook these steaks without it. so she goes into another RV, and she comes out with official mario batali-brand salt and pepper grinders. they are huge, and they are still wrapped. amazingly, they came pre-loaded with salt and pepper. "will this work?" actually, yes, it's perfect. i felt like i had been tested, and that i had passed. so i salted and peppered the steaks, and i put them over the broiler element to give us some grill marks. i have never heard such a sound as when these steaks hit that iron. it was instant branding. it made me feel like i knew what i was doing. it was amazing. so i got the marks on both sides, then i turned off the middle burner, moved the steaks there and closed the grill. my plan was to saute the spinach and serve the steak on top of the spinach. and i was going to dress the spinach with olive oil and lemon juice. so then i looked at the salad greens, and decided i could make a salad while the steaks cooked. but for dressing, the only acid i had was the two lemons i wanted to put in the spinach. enter that mystery green bottle that i thought was olive oil. it was dark, so i could barely see the label, but i know a few italian food words, and i didn't see the word "aceto" or "olio," so i couldn't determine whether is was vinegar or oil. so i poured a little out on my finger to see what it was, and when a thick, syrupy black glaze came out, chills ran down my spine. from the looks of it, i suspected it was very, very expensive balsamic vinegar. then i tasted it, and i was pretty sure that was what it was. i had always heard that with really good balsamic, you could pour it over vanilla ice cream. i had never had balsamic that i could imagine doing that with. but this stuff, i could totally see doing that. i have considered buying high-end balsamic in the past, and i have found it to be more than $150 for a 3.5 oz bottle. this bottle was probably 8-10 oz. as i did math in my head, i asked darcie if she really wanted me touching this bottle. she laughed. "sure!" so then i had another issue to contend with: was i really going to use remarkably expensive balsamic for ... salad dressing? if this vinegar was what i thought it was, i was about to make the most expensive salad dressing i had ever heard of. "do it!" darcie said. i have seen mario make simple things with extravagant ingredients before, so i hemmed, and hawed, and made salad dressing. it was really, really good salad dressing. the vinegar was so viscous, it took very little effort to emulsify it with the oil with a fork. which was good since there was no whisk in sight. i made a salad with the romaine, arugula and pepitas. i later i wished i had thought about it more, because there was cheese on the table, and there were pears and apples in one of the RVs, and there was bread that i could have grilled to make croutons. but instead, everyone got a plate with lettuce, pumpkin seeds, and about $50 worth of salad dressing. i told darcie that as adamant as i was that she tell mario that i refused to cook the steaks without salt, i was totally ok with it if she never told him i made salad dressing out of that balsamic. after i found the pears, i cut one up and drizzled some of the balsamic over it and served that by itself. afraid for its potential fate, i really wanted to take the vinegar home with me, but i couldn't find the cap. and i tried to figure out ways to get it home without the cap. but i eventually gave up. after i guessed that the steaks might be about done, i took them off the grill and covered them with some aluminum to let them rest, and wilted the spinach in a mario batali saute pan over one of the burners. (there was also a mario batali lasagna pan on the table, and i was eyeing that hard. i was afraid to say how much i wanted one of those, because i had already gotten so much stuff that weekend and i was afraid she might give it to me. plus, it probably weighed 10 lbs, and i didn't want to try to get it on the plane.) i added the lemon juice to the spinach, then sliced the steak, and at first i was afraid it was overcooked. but when i got better light on it, i decided it was about perfect medium-rare. i carved it up, and plated it on top of the spinach and went to the table. it all tasted good to me. darcie said that usually if she sits around long enough, someone brings her incredible food to eat. so, basically, i need to sit around her more often. but while i was cooking, she declared me a member of the mario batali family, which wasn't listed in the official list of prizes, but is really, really cool. there is no way to recap what happened on sunday in one post, so i am going to space it out over three posts. my tentative outline is to start off with what happened before the race, then what happened after the race, then catch up on everything i meant to say in the first two but forgot. also, ask me questions about stuff, and i will address them in the third post. some of this will be straight out of my post on laura's blog. people keep asking me if i had fun in texas. rachael ray bowed to me. three times. and mario batali kept describing my dish with variants of the same two-word sentence structure: "(expletive) (exclamation)!" the expletive was the same each time. the exclamation varied between "awesome" to "amazing." i think there were others. yeah. it was a good weekend. we got picked up at the hotel at about 7 a.m. and ended up at the tailgate party site in the middle of the speedway infield about 8. there is a little activity, and darcie asks us if we've had breakfast. we had not. so she asks krista, mario's food stylist, to make extra for us. she also told us that mario had asked what we had done all day saturday and to make sure we got to hang together on sunday. i figured that the tailgate party would be my best access of the weekend, but it was nice to hear. breakfast was green eggs and ham, and chilaquiles. the eggs were cheesy and covered in green chile. the chilaquiles -- tortilla casserole -- was full of really good chorizo. as we're eating, mario asks me when my pace car ride is. i say, right after breakfast. he laughs and suggests that having breakfast might not have been the best idea. "leave the window open," he suggests. "the car is always going to turn left, so you want to barf to the right." as we left for the golf cart on the way to the pace car, mario reminded us, "aim to the right." soon after we got back, rachael showed up, and within a couple of minutes, she was walking emphatically toward me making extreme hand gestures and shouting, "pig in pig in pig! where is it?" i wasn't in charge of cooking anything, so i honestly had no idea. but that was when she started bowing. i have to say, i really, really wish there had been video of this. we sat with mario and talked for awhile, about what, i really have no recollection. but pam got pictures, and i seem to be talking, and mario and rachael -- cuz that's what i call them now -- are looking like they are listening, and maybe even interested. i remember i told rachael how much i liked the deviled eggs at the asphalt chef party the night before. because they were awesome. pam told her she like the buffalo chicken meatballs. "i try to give the people what they want," she said. i was impressed i was with how real and sincere she was. my phony detector has a hair-trigger, and i thought she was great. the woman is insanely famous. people were falling all over themselves just to get a glimpse. and there we were chatting, and the fact that she seemed legitimately interested in my dish is still hard for me to comprehend. so mario and rachael had to go to an interview and were gone for about an hour. i spent the time talking to people from uncle ben's and from the food bank, and basically walking around, trying to burn off nervous energy. then darcie came back from the interview and yelled at me to not move, because rachael was about to come back and they wanted to record for her show. at that point, i kind of freaked, because i had no idea what i was supposed to do or talk about, or how much i would stammer. 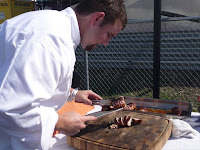 so just before they got back, one of the speedway's chefs put the meat on the grill, and krista handed mario a pair of tongs, and all of a sudden, mario was at the grill, rachael was standing next to me, and from somewhere, there were like 20 cameras, still and video, crowding around us. looking back, this would seem to have been the most totally surreal moment of the weekend, and i don't understand how i wasn't overwhelmed to the point of collapse. but the truth of the matter is -- and i know this sounds stupid -- it felt totally natural. because the scene was set as if we were three pals grilling ... and that was exactly what it felt like. i would be interested in seeing the video, to see if i was incomprehendibly stupid, because i suspect that is totally possible. but it didn't feel that way. and when i see the photo that moved on the wire (click here), i'm amazed at how natural it actually looks. mario is using his own camera (and i would like to get a copy of that photo, actually). rachael was leaning back into me, and was lifting the tongs up over my head to pose for mario. see? it sounds weird, right? there's no way to say it that it doesn't. but it was AWESOME. so mario turned all the pork packs, and it was going to take those things more than a half-hour to cook, so we broke, and suddenly, there was a line of reporters who wanted to talk to me. they all wanted to talk to me separately, so i really wished i had prepared a story so that i could be consistent. because i knew if i started rambling, i would come up with a different aspect of the story each time, and it would sound like i was telling them all completely different stories. but that didn't seem to happen. i think. we'll see. after that, tim, left, the track chef who was cooking the dish, came up to me and seemed nervous to be talking to me. he called me "chef" more than once. i giggled. tim said that he was afraid that the pork would burn if he left it on the grill, and he wanted to know if it was ok if he finished them in the brick pizza oven. yes, it was ok with me. he also asked me to try the glaze. when i made the glaze, i just heated up some oj and melted the marmalade into that, and kept adding marmalade until it was the consistency i wanted. they clearly had more than that going on in theirs, and whatever was in there, it was really good. tim asked for my approval on the glaze. i gave it. i'm not sure what would've happened if i had not. unfortunately, sometime between the photo shoot and the pork coming out of the oven, rachael had to leave, and i am legitimately disappointed she didn't get to try it. tho i am devising a plan to get it to her. i'll let you know if/when that happens. getting the pork out of the brick oven turned out to be another media event, as a photographer wanted me to slowly take the pan out of the oven. which would've been ok, except that the oven was like 800 degrees. slow isn't how you reach into an 800 degree oven. we got it out, and i started directing tim to grab one of the pork packs out of the tray so he could start carving it while i finished my media obligations with the photographers. it was at this point that i realized that it was probably now technically ok to be called "chef." but i still wasn't comfortable with it. tho i want to be. when the pork was carved, mario came over, tim anointed the pork with the glaze, and the cameras started popping as mario reached in for a piece and told me to, also. we both tried, with cameras still popping. it was really good, i thought. "(expletive) (exclamation)!" mario proclaimed. it was really, really good. they used the sauce more liberally than i had, and i really liked it. so did mario. (that's krista in the photo with me and mario). it was at that point i realized that rachael was gone, and mario told me that he had already taken a picture of the pork and e-mailed it to her, mocking her for leaving. it's sort of ridiculous for me to talk about anything regarding this weekend as "disappointing," but i would've loved to see rachael's reaction to tasting it. because it was awesome. maybe even (expletive) awesome. i told mario that i was willing to come to new york to make it for her. he motioned me over to a table and said, "let's talk about that ..."
we sat for some time and talked for quite awhile about restaurants and cooking and ... a lot of stuff i don't remember. every once in awhile, it would just hit me where i was and what i was doing, and i think my memory just turned off. but it was a lot of fun. i have talked to a few celebrities here and there, and it is often extremely awkward, insomuch as you really have nothing to actually talk about. it was never like that, with either mario or rachael. i immediately felt like i had known them forever. darcie got us two extra passes to the tailgate party, which gave me the chance to see barry harrell and his wife carrie, who moved to texas last year. i was really happy to get to hang out with them, even for only a short time, and i was really happy that they got to try my dish, and everything else on the menu. they got to meet mario, and got some pictures and autographs. then pam and i got a picture with barry and carrie ... taken by mario. at that point, it was time to go to the suite to watch the race. 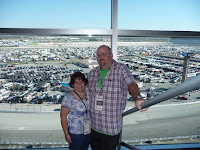 we were in a different suite than mario, and he was going to be leaving for ny before the race ended, so we said our goodbyes, got on the golf carts and headed out. that's where i'll pick up the next post. may take a day or two. so, when i do the post re-capping today, i want to do it right, and i am exhausted and have a plane to catch in the morning. so for the time being, i put up a brief synopsis on the step blog (click here), which is worth going over to look at if only for the ap photo that is on there (i can't legally run it here, but i could run it there since the paper subscribes to ap.) but the truth is, that photo sums it all up, right there. mario batali taking a picture of rachael ray leaning up against me with a pair of tongs. yup, that was my weekend. more to come. very, very sleepy. my first day at the track, and ... wow. we didn't get a lot of time with mario, but it was amazing. we got to the texas motor speedway at about 9 a.m. and headed to the infield, where they were setting up the area where the tailgate party will be on sunday. we hung out there for a bit when darcie, mario's brand manager and my contest contact, got a call from mario saying he was here early, and can they send the helicopter now? I had been pretty excited that we got a driver to bring us in. I didn't know a helicopter was an option. when he landed, we met him for about 15 seconds, then our handlers -- i have handlers this weekend -- took pam and i on a vip tour of the track. i have rarely felt so important. These guys, doug and bruce, were amazing, driving us around to the garages, the pits, the infield, the midway, and eventually to our seats in the suite and the winner's circle. we got another few minutes with mario, and by then rachael was there, too, at the sprint trailer on the midway, where they were doing a q&a session. pam and i got to stand on the stage during the event, then they were whisked off again. after the race, we went over to the speedway's country club, where mario, rachael and dallas chef tim love competed in an iron chef-styled event called the asphalt chef. 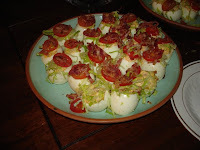 it was a big party, with each chef contributing some appetizers, and i have to say, rachael's bacon & deviled eggs, pictured at left, were the best thing i had there. the picture doesn't look great, but they were actually very attractive in addition to be excellent. there were party favors: everyone there got a pair of orange crocs. oh, and the secret ingredient in the asphalt chef challenge was chili peppers, and mario, who was paired with driver juan pablo montoya, won. he made a shrimp summer roll and grilled flank steak with two pepper sauces. sounded good to me. tomorrow is the pace car ride, then the tailgate party. i am really looking forward to the tailgate party.